This post underlines my bendibenri blog. It has been over a year since I documented my adventures in the kitchen in this blog, however that doesn’t mean things have been quiet where experimenting with food is concerned. I have since moved over to vegetarianism although I could call myself vegan, but I’m sure that some animal products sneak themselves into food when I eat out – and those I cannot control. That said, putting a label to my eating habbits doesn’t feel right because they are often judged in so many ways. The truth, in short is, I want to live a predominantly plant-based diet which is highly alkaline forming to help me achieve optimum health, sustain good energy levels and help prevent sickness. This new start, I feel, warrants the creation of a new blog to enable me to keep motivated and stay absorbed in one of my biggest loves – food. I’m so excited about it and have so many recipes I’d like to share that my meat-eater friends also give their thumbs up to. If like me you are in to eating for good health please join me. I’d love to hear from you and your views and opinions. …simple Indian home remedies, which almost every Indian household has. One such remedy is haldi ka doodh which translates into turmeric milk, which is simply that, turmeric (haldi) with milk (doodh). white bean + avocado dip. I’ve always wondered if there was a way that guacamole could be improved upon. I’ve discovered that there is. Well, that’s if you consider making it healthier an improvement. An easy vegetarian dip loaded with fiber and flavor! This was my first attempt at making risotto without assistance from my wonderful rice cooker. The recipe was one from Jamie Oliver‘s 20min meal iPhone app where the directions are so easy it’s ridiculous at how beautiful it tastes. 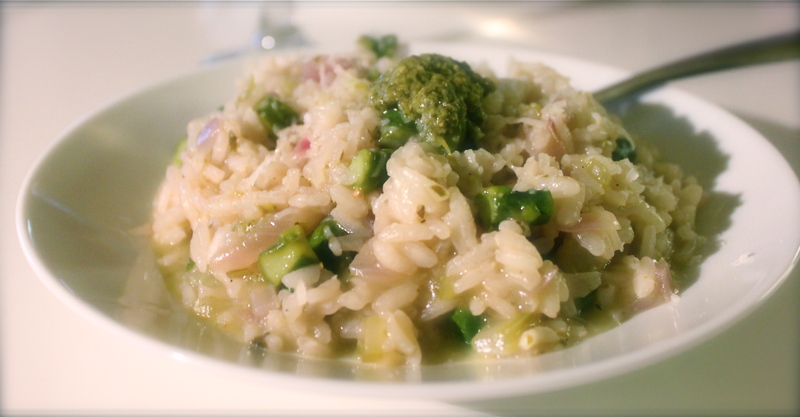 If you love risotto like I do, then try this one out! yuuuummmmm…..
Bring the stock to the boil in a medium saucepan, then turn the heat down to low. Snap the woody bases off the asparagus and add them to the saucepan of stock. Slice the remaining tender stalks up to the tip then leave the tip whole. Put to one side. Once your vegetables are very soft (but not browned) add the rice to the pan. Stir & fry the rice for a minute until translucent, then add the wine and keep stirring until all the wine has absorbed by the rice. Turn the heat under the rice up to medium then add a ladle full of hot stock, avoiding the asparagus stalks – these are there to add flavour but not to be eaten! Stir constantly and continue adding stock, a ladle at a time, waiting for the rice to soak it all up before adding the next ladle full. Continue until you’ve used tow-thirds of the stock. 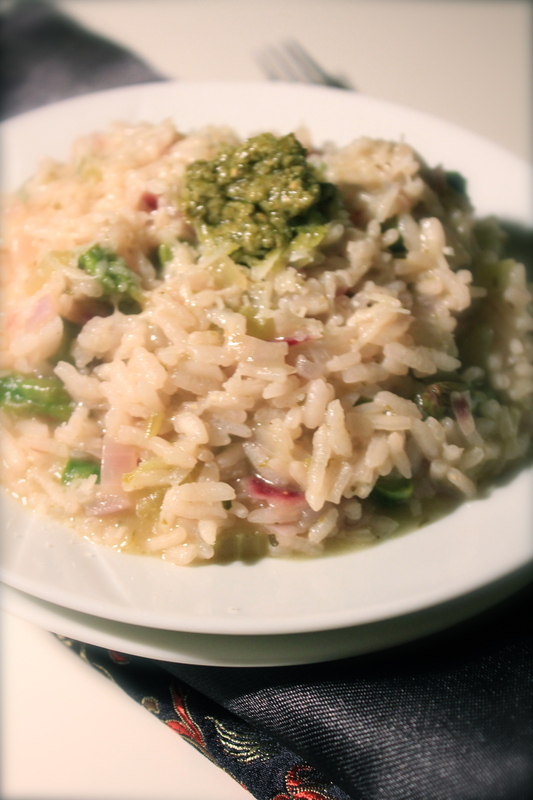 Once two-thirds of your stock has been added, stir the sliced asparagus and tips to the rice. Keep adding the stock until the rice if just cooked and the risotto has a nice oozy consistency. If you run out of stock, use boiling water. Take the pan of risotto off the heat and stir in your teaspoon of pesto and half the parmesan. Cut your lemon in half then squeeze in a little juice. Taste the risotto and season with salt and pepper (if you need it). Cover the pan with a lid. Divide the risotto between the two warmed plates. Sprinkle over the remaining parmesan and top each with a dollop of pesto. DONE! Distracted from the books again, but this time in the shape of an amazing cake recipe from the BBC GoodFood website. This recipe is full of all the right things, but far from healthy, although I do trick myself into thinking a cake like this is good for you… it does contain fruit after all. Anyway, what’s life without a little indulgence ehe? 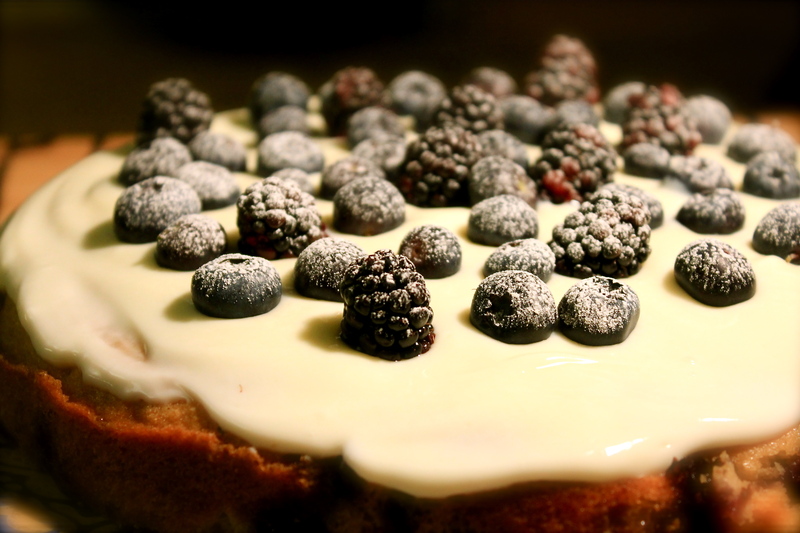 This recipe is super easy and looks really pretty too, but most of all it tastes…well…find out for yourself, I swear you WILL love it 😛 oooo and the cream cheese and soured cream frosting with those beautiful little berries as they pop in your mouth….mmmmmhmm…. I wish I had made this cake in the morning to capture an image in the best of the day light, but artificial just had to do as I was definitely not going to let this little beauty tease me until morning. You can find the recipe here. 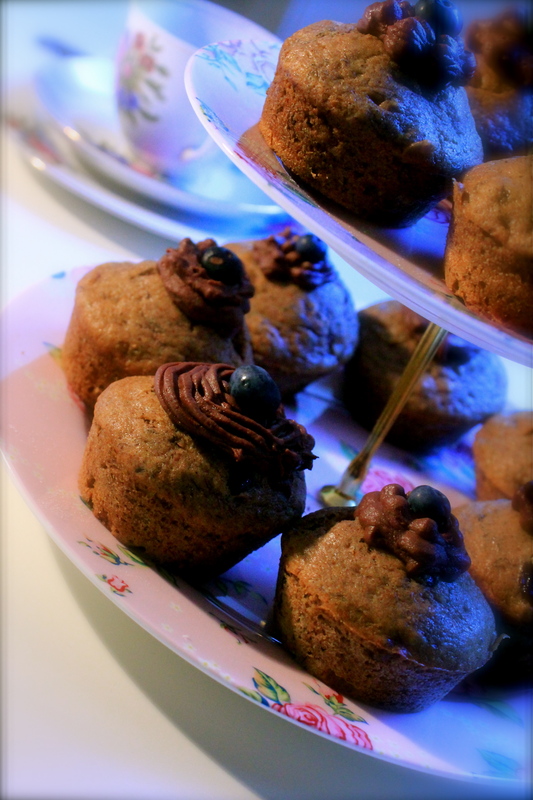 The only adjustment I made was reducing the sugar from 175g to 100g and used half blueberries, half blackberries. 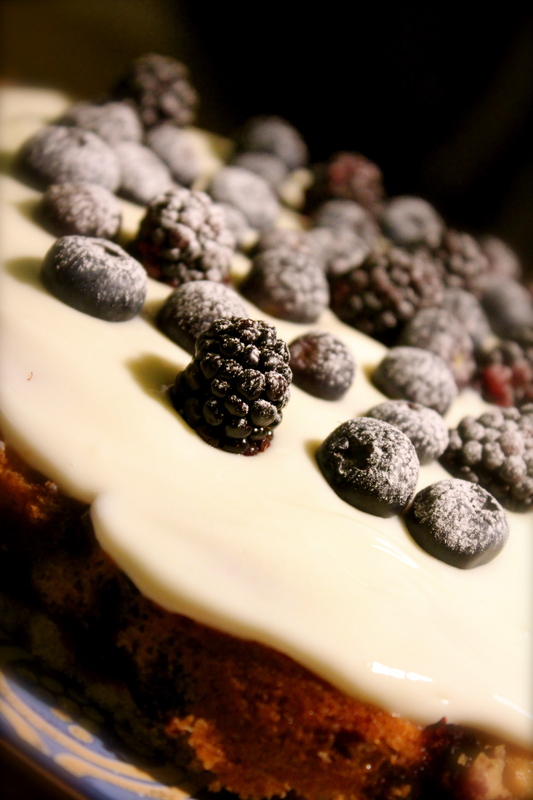 The tanginess of the blackberries really balanced out the sweetness of the frosting making it very moreish. Last night was a strange one… Awoken at about 2am, soaking from head to toe and covered in what looked like spangly spiders. I also remember frantically searching for the light switch saying something (not sure what though) to scare the spiders away….ewwww…it makes me shiver thinking about it. 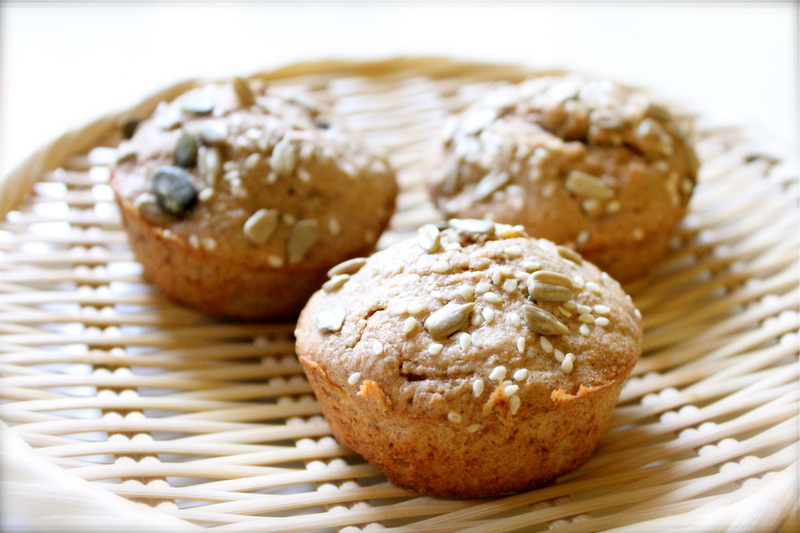 Hot from the oven…I forgot how good they tasted…would you like one? (by the way, I know what you’re thinking, “is that all she can cook?” … it’s not honest…it’s just that they’re sooo quick to make and absolutely satisfying). Wow! It has been a while, but now I’m back. I am absolutely consumed by my MSc, but more about that another time. What is important is my return to the kitchen. What better way to inject life into my passion for food and baking than experimenting with yummy Hummingbird cake recipes. My wonderful friends Ali n Ali bought me the cookbook for Christmas quite conveniently a little before Mrs Ali’s 30th birthday celebrations 😛 . 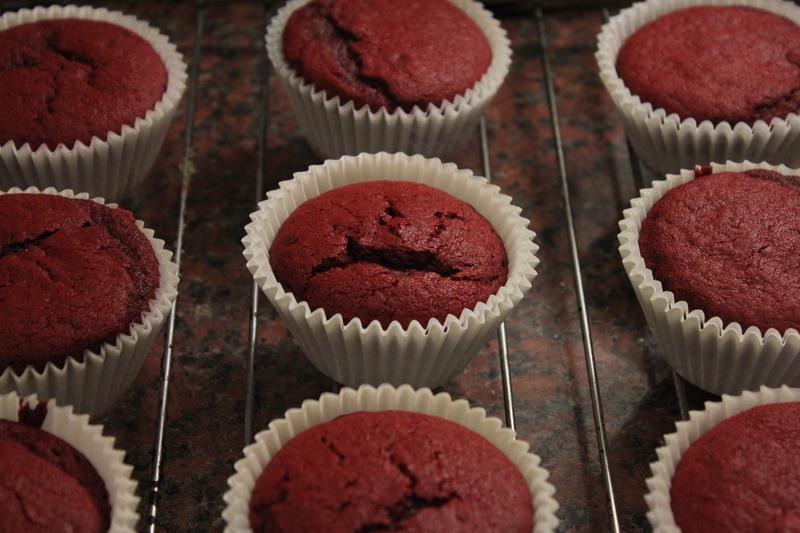 A great excuse it was too to make some gorgeous red velvet cupcakes and chocolate ginger cupcakes topped off with cream cheese frosting (mmm…yeah… I know they don’t fit into the whole healthy cooking theme I have going here, but it was for a 30th birthday after all). 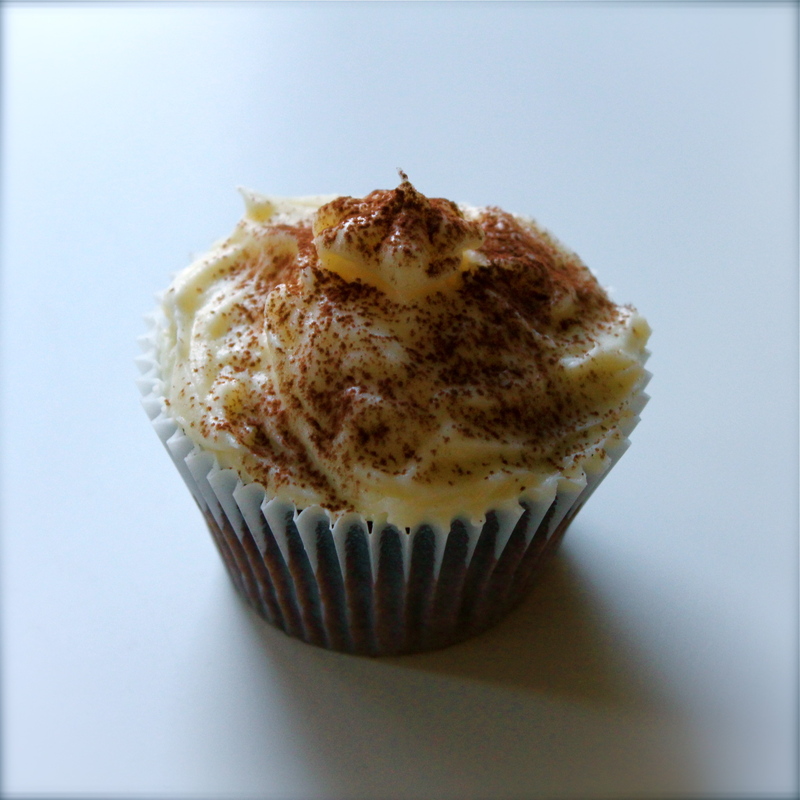 Anyway…My first attempt didn’t go quite to plan, possibly due my uncontrollable need to change every recipe I try out. However, take 2 and 3 were actually not too bad, maybe not as beautiful as those by the experts in Hummingbird bakery, but they did taste pretty good (well, Andy and I thought so anyway). put the flour, cocoa powder, sugar, baking powder, salt and butter in a free standing electric mixer with a paddel attachment and beat on slow speed until you get a sandy consistency and everything is combined. Whisk the milk, egg and vanilla extract together in a jug, then slowly pour out about half into the flour mixture, beat to combine and turn the mixer up to high speed to get rid of any lumps. Turn the mixer down to a slower speed and slowly pour in the remaining milk mixture (scrape any unmixed ingredients from the side of the bowl with a rubber spatula). Continue mixing for a couple more minutes until the mixture is smooth. Do not overmix. spoon the mixture into paper cases until 2/3 full bake in a pre-heated oven for 20 -25 min (if using large muffin cases) 15 min (if using small fairy cake cases). Leave cakes to cool on a wire rack then decorate as you please. 60g unsalted butter at room temp. 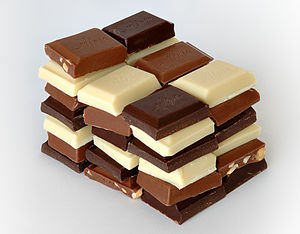 Chocolate is my vice, especially on days like these when you have to study. I will do anything to put me into a mindset to open a 700 page textbook. Luckily I don’t have to look too far. A bar of 75% chocolate is all it takes for me. My morning net search took me to my new favourite food blog ‘My Darling lemon Thyme’ where I found a scrumptious looking chilli chocolate slice recipe. I can’t wait to try out more of her mouth watering recipes. Take a look, I’m sure you will all agree. Like any recipe I want to try out without pre-planning, there are always ingredients you never have. In this case, I had already finished off the last of my blueberries over breaky so I used some dried fruit, and I have also never bought tapioca flour before so I used 1 1/2 tablespoons of corn flour. There seems to always be substitutions on hand so the baking commenced and the results were just as I had expected, utterly satisfying. Now where is that textbook of mine? Preheat your oven to 15o degrees/ 275-300 f. Grease yourself a slice pan about 20 x 20 cm. Line the base and sides with baking paper and make sure about 2cm of paper extends up and over the edges of the pan. Melt chocolate, butter, sugar and chilli together in a small saucepan over low heat. Pour into a large bowl and set aside for 10 mins to cool slightly. Gently stir in flours, almond meal and eggs until combined. Fold through blueberries. Pour mixture into prepared pan and smooth off the top with the back of your spoon/ spatula. Bake 35-45 mins or until cooked when tested with a skewer. 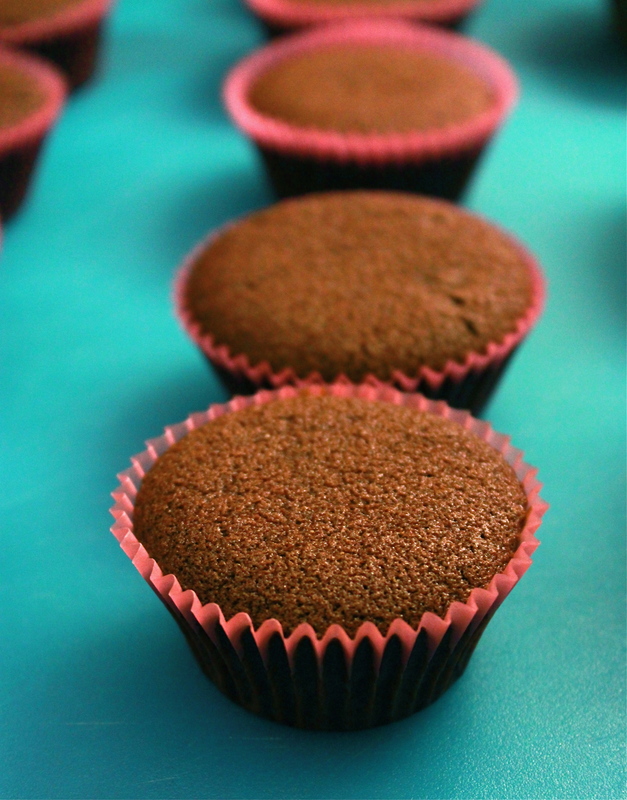 Leave to cool in the pan before cutting into small squares, dusting with cocoa powder and devouring! Or if you have some serious restraint, hold off eating till tomorrow. NB If using fresh berries I’d say they would take about 30-35 mins. If using Frozen like I did, allow a little longer – mine took 45 mins to cook. Heavily adapted from a little women’s day cookbook called “Family favourites – easy biscuits and slices”. 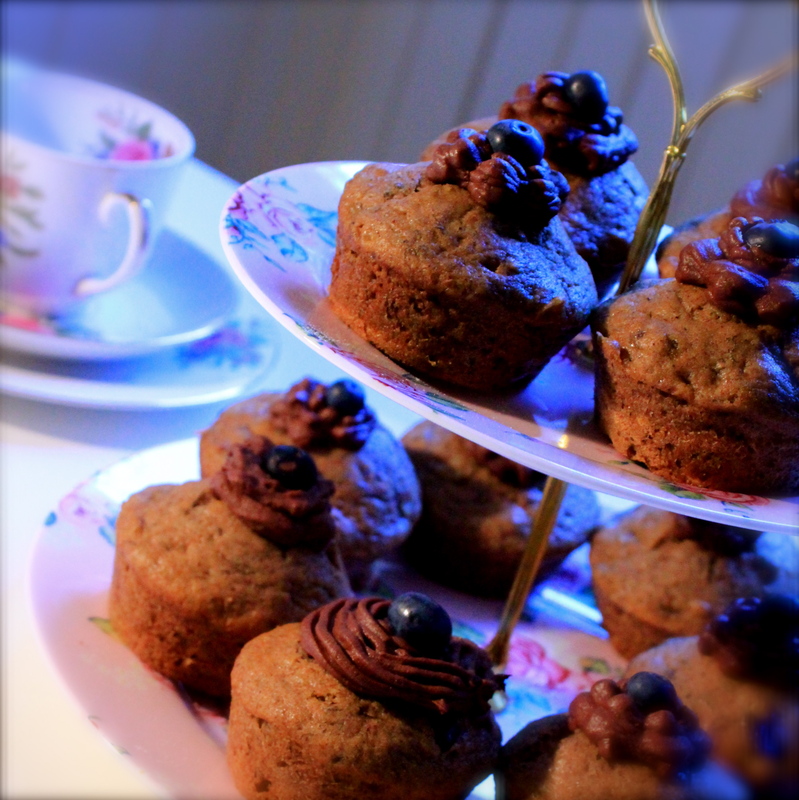 Here you will find my yummy banana loaf recipe in the shape of little manly style cupcakes. 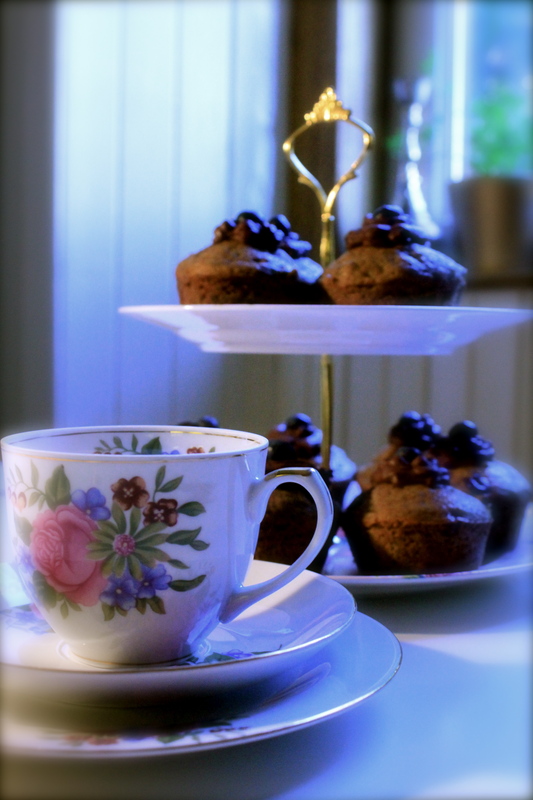 I was going make a traditional cup cake recipe with all the frills and a variety of flavours, but I didn’t! Instead, I settled on, in my opinion, the perfect sponge. 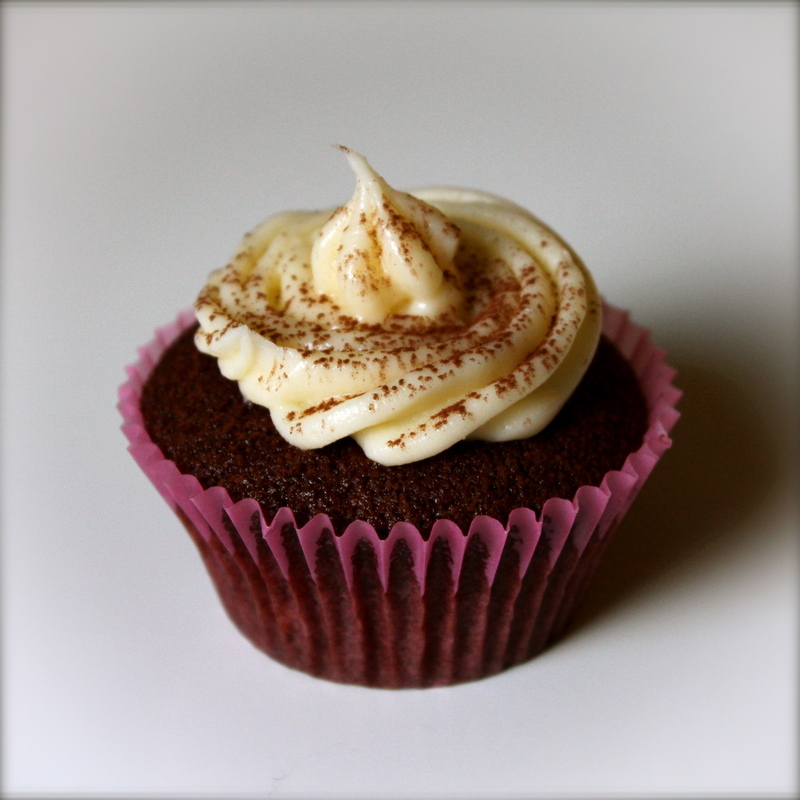 They are like mini banana loaf buns, however, this time I topped them with a chocolate & cinnamon cream cheese frosting for added naughtiness. 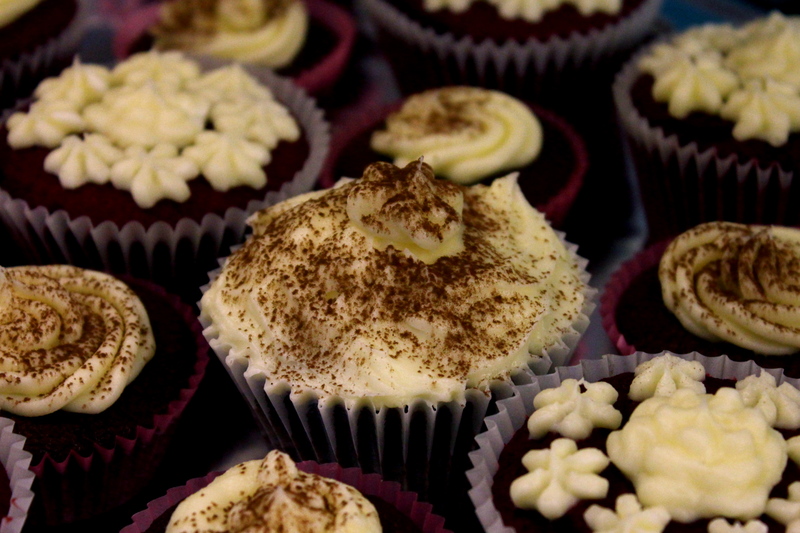 They do look a little manlier than your usual cup cake, don’t they? So that’s who I made them for, a newly turned 30-year-old man. Welcome to my world! Mix together the mushy bananas. Mix in the chocolate raisins and crushed walnuts. check for they’re by piercing the center of a cup cake. If it comes out clean, cool at room temperature then decorate as desired. How would you describe your eating habbits? Do you live to eat or eat to live? I think from this blog of mine you can more or less guess which I'd use to describe my eating habits. From cakes to salads, I want a reason to justify why I make or eat them. I will also never compromise on flavour, which is why I try to use only the freshest of locally grown ingredients. Even now that I am a poor student I will never give in to value pack offers from huge supermarket chains! If I can't eat a lot, at least I know I consume what I need to stay healthy. I hope you like my blog. I'm still learning and experimenting, with both cooking and photography, so if you happen to stop by or pop back to take a look from time to time, please feel free to make suggestion, leave a simple comment or to simply rant. I'm looking forward to hearing what you have to say.